BUSAN ― Autumn is a romantic season. Of the three months that are counted as autumn, October lies in the middle and is perhaps also the peak season of romance. Spending the season of romance at the “city of romance” may maximize the love story. The sparkling lights along Gwangalli Beach in Busan create a beautiful nightscape, adding much to create a romantic atmosphere. The Gwangan-daegyo (bridge) and its surrounding buildings light up at night in all colors embroidering the sea in rainbow. The bridge, which stretches over a distance of 7.4 kilometers across Haeundae Beach, is also called the “diamond bridge” for its sparkling appearance. A cruise ship, the “Tiffany 21,” runs beneath the bridge taking passengers on an enchanting journey. A tour along the beach runs for two hours starting from noon to midnight. 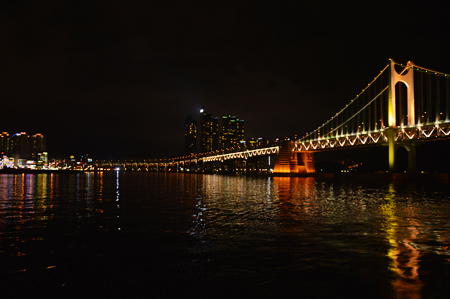 To embark on the most mesmerizing experience, take the cruise at night. The ship runs at dinner time from 7 p.m. to 9 p.m. and also from 10 p.m. to midnight. During the dinner slot, passengers may enjoy live music with steak and wine. The late night cruise offers semi-buffet and live music. On the day this Korea Times reporter boarded, a young man proposed to his girlfriend on the cruise. The scene was like many that we have seen in movies, but without the romantic soundtrack running through. Instead, other passengers on board clapped in unison to congratulate them. Another great way to view the incredible nightscape of Busan is to take the city tour bus. The bus starts off at Busan Station and makes a round trip around Haeundae Beach, Dalmaji Hill, Gwangan Bridge and Mt. Geumnyeon back to Busan Station. Some tour buses are open top so that you can feel the breeze. Another recommended site for viewing the nightscape is Mt. Geumnyeon. From the mountain, which is 415 meters above sea level, you can view the entire city, as it emits a soft glow of light. From the top, Gwangan Bridge looks like a glittering stream of light that flows over the water. The road along the mountain is known to be the most popular dating route for lovers. Along the road to the top, there are rows of cars parked along the side of the two-lane road, leaving just one lane for driving cars to pass. According to Busan residents, the number of cars multiplies at night as the drive way is dark and quiet ― a perfect place to enjoy a private date. On the way up, there is an observatory where you may park your cars and get a view of the city. But the greatest nightscape is yet to come. The most beautiful is available when the Busan International Fireworks Festival is held. The event, which takes place every year, will be held on Oct. 26 and 27 this year on Gwangalli Beach and the Gwangan Bridge area. The main fireworks show will take place on Oct. 27 from 8 p.m. to 9 p.m. On the previous day, K-pop stars will perform on a stage at the Gwangalli Beach as part of the pre-event. Sample fireworks will be fired that day. 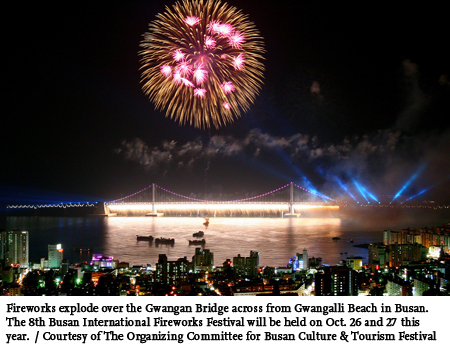 During the main event on Oct. 27, about 80,000 fireworks will be set off along the Gwangan Bridge during the one-hour show. The fireworks will embroider about 1.2 kilometers of the bridge. The show involves all kinds of multimedia from laser art to music and video. “Our fireworks festival is topnotch. We’ve got one of the biggest fireworks in the world. There are fireworks that go up 500 meters above ground and spread across 400 meters. Also, there are fireworks that flow down from the bridge resembling the Niagara Falls. Those who came to the festival say it’s one of the must-see sights during their lifetime,” said an official from the Organizing Committee for Busan Culture & Tourism Festival. “The theme is falling in love in Busan. You may fall in love with Busan, in Busan, or propose to your loved ones here. We will hold a 1 to 2 minute proposal event when people can propose to their partners,” he said. The festival began in 2005 when the APEC summit was held in Busan. The city was thinking of a special event for the foreign VIPs and the fireworks were tried out. The result was a success. Then-U.S. President George W. Bush praised the event and the city began holding it annually since then. There are about 10,000 foreign visitors to the fireworks festival every year. The organizing committee expects about 1 million visitors in total this year. Strolling along the beach or viewing the nightscape on a cruise in Busan is romantic, but the fireworks may intensify the experience.